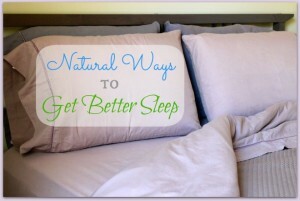 Matt and Betsy of DIY Natural have a great post on how to fall asleep naturally. They provide details on 5 herbal teas, 1 essential oil , a natural way to add magnesium to your system, and two other helpful methods. Click the 6 Natural Ways to Get a Better Night’s Sleep link below for some helpful information on naturally getting a good night’s sleep. I love taking valerian root at night when I can’t sleep. Puts me out like a light and I have fantastic dreams. Chamomile tea before bed is also a favorite of mine. Its very relaxing.